(1) Set An Antique Hunters Mystery (5 Book Series) Print U.S. Only - Digital International. In 1865, Elizabeth Keckley, Mary Todd Lincoln’s dressmaker, conspired to change the course of the Civil War. Crossing lines between North and South, the band of conspirators wove a plan that remained undiscovered for more than 150 years until Antique Hunter Anne Hillstrom finds one of Keckley’s gowns. She and fellow Antique Hunter CC Muller unravel the mystery that has left a trail of dead bodies, leading to the doorstep of their antique store, Great-Aunt Sybil’s Attic. 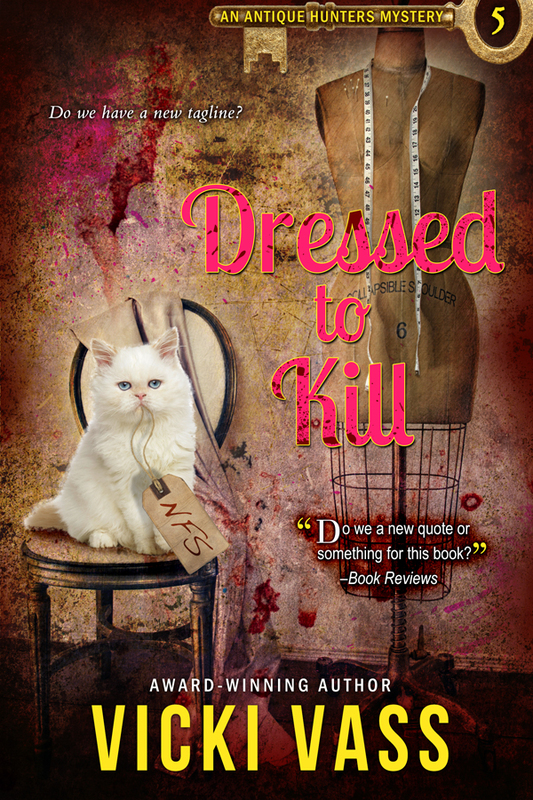 Dressed to Kill is the fifth book in the Antique Hunters Mystery Series. Rooted in history, the series reimagines real-life events blurring the line between fact and fiction. With a passion for shopping and antiques, Vicki Vass turned in her reporter’s notebook to chronicle the adventures of Anne and CC, two antique hunters who use their skills to solve a murder case. 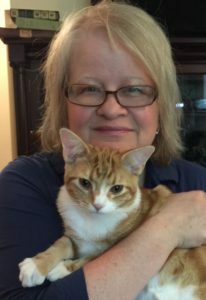 Vicki has written more than 1,400 stories for the Chicago Tribune as well as other commercial publications including Home & Away, the Lutheran and Woman’s World. Her science fiction novel, The Lexicon, draws on her experience in Sudan while writing about the ongoing civil war for World Relief. 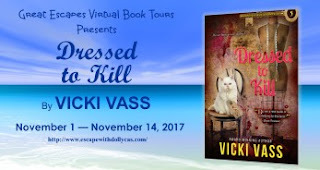 She lives in the Chicago area with her husband, writer and musician Brian Tedeschi, son Tony, Australian shepherd Bandit, kittens Terra and Pixel, seven koi and Gary the turtle. Thanks for featuring me and Dressed to Kill. I, too, am a lover of vacations and sweet tea. Planning my next trip in two weeks and bringing a box of books.